Add me to your RSS feeds! Chelle-Chelle.com is many things; a collection of crocheted goodness, a series of crafting articles, a smattering of knitting projects from a very challenged knitter and a showcase of original jewellery designed and created by me, Michelle. Have a great idea for an article at Chelle-Chelle.com? Click here to see the upcoming articles and leave your suggestions! I made these back in February, took photos of them on April 1st and got around to uploading them a few days ago. And posting them now. Because it takes a few seconds. I picked up a vial of mixed beads at a store a while ago. I was debating between sorting them or just using them as is – I decided against sorting. I poured out the beads into a tray and picked up whichever ones were closest and just strung them on and this is what I ended up with. I forgot to do measurements before writing this, but they’re probably approximately 2.5″ in length, without including the fishhooks. 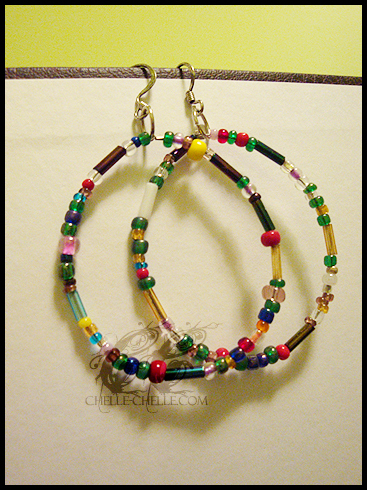 Materials: base metal jump rings and crimp tubes, nylon coated wire, antiqued silver fishhooks and multi-coloured plastic and glass seed & bugle beads. Those earrings are pretty spiffy lookin’, too. I especially like how you didn’t just make them identical, yet they still maintain the feeling of actually being a set of earrings instead of two separate similar style earrings. I’ve been looking for something different and I love these patterns. Anxious to get started. Chelle-Chelle.com uses valid CSS and XHTML. Chelle-Chelle.com is © 2008-2013 Michelle.